For this month's "Maps Of The Month" featurette, I wish to draw your attention to mechaskrom's Suikoden II (PSX) maps. Suikoden II takes place years after the first Suikoden game. Here, the kingdom of Highland is invading the City-States of Jowston. You play the adopted son of a hero from a previous war. Though you start off as a member of the youth brigade in the Highland Kingdom, you will soon end up leading the New Alliance Army and fight against Highland, and the evil prince that leads it. This is a big JRPG with lots of variety. There are three different modes of combat, from one-on-one duels, group battles, and massive battles. There are crazy side-quests and mini-games. "Iron Chef"-style cook-offs? Whacking moles? Recruiting squirrels? Why not? It's all here in this huge game. Like the first game, there are 108 possible recruits (the "stars of destiny"), which is quite a large number of characters, considering that each of them have a part in this epic story! Also like the first game, you have a base of operations that grows during the course of the game, and mechaskrom has mapped out its various forms. It's a feat enough that mechaskrom has mapped all of this! It's not the first time, either. Back in February 2013, mechaskrom was also recognized here on "Maps Of The Month" for mapping the first Suikoden game in its entirety. He's definitely a fan of this series! 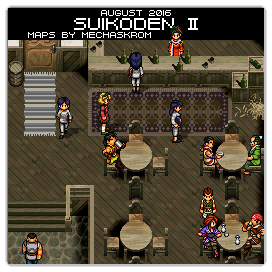 So to recognize the effort put into mapping yet another entry in this underrated JRPG series, mechaskrom's Suikoden II (PSX) maps will be known as VGMaps.com's Maps Of The Month for August 2016. It took a lot of time to map this game, but I'm very happy with the result. Suikoden 2 has really nice graphics and a lot of details, especially in the cities, so having maps of the areas and be able to see all of it is satisfying. It's a real shame that a lot of the offscreen areas are incomplete, for example Milich's house in Gregminster or the two mansions in Kyaro (probably the most beautiful place IMO). I didn't want to change the game's original graphics so the maps are mostly rips straight from the game regardless of how incomplete they are. But seeing what the designers did or didn't do is also interesting in a way. Suikoden 2 fortunately has relativily simple graphics with few animated background objects, only 1-2 scrolling layers, etc, so it was pretty easy (but still time consuming) to map. The only effect that caused some problem was the water-effect used on the world and in a few cities. I'm talking about that static background layer with a dithered gradient which looks awful IMHO. I had to replace it with a solid color and I hope that my choice wasn't to bad. I didn't find anything to interesting when mapping Suikoden 2. There is an unused small room in Tinto which probably was meant to be that locked tool shed. There is also an unused small room in Headquarters. So nothing here like that big unused room in Gregminster Palace in Suikoden 1. Amazing work considering the size of the game! A well deserved MotM. Great work. Interesting that Banner Village is displayed on the map... if I remember correctly, you're just taken there automatically and can't normally see it. Likewise with Magician's Isle in the first game, which oddly, you *can* see on the mini-map, but are, again, taken to and from it automatically. Suikoden 2 have a lot of weird stuff off screen. I like that "programmer/artist note" in the north of Greenhill. I wonder what that japanese text says? Probably something like "AREA E" also? You can take a boat from Radat Town, that you actually are in control of, to get to Banner Village (it is the only way to get there the first time). Magician's Island in Suikoden 1 can't be seen on the world map normally that I know of so there you remember correctly. The Japanese text on the world map reads something like: "You cannot see this far" or "There's nothing to see here". So basically, a cute, quirky comment. Thank you for the translation. That comment is pretty funny and true.